Today marks the 40th anniversary of one of the most important pieces of water legislation: the Clean Water Act. On October 18, 1972, the U.S. Congress enacted the Federal Water Pollution Control Amendments, now called the Clean Water Act, by voting to override President Nixon's veto. This law has given the nation the tools needed to begin cleaning up the nation's increasingly contaminated waters, and it has proven to be one of the most important, effective, and highly regarded environment laws in the world. By the middle of the 20th century, industrial pollution was so prevalent in our nation's waterways that, in some cases, the pollution in our rivers actually caught on fire. The Potomac River running through Washington stank so badly it interfered with the business of the nation. In August 1969, Time Magazine wrote about the nation's dying rivers, the grease balls from meat packers filling the Missouri River, the burning Cuyahoga River, and the dying fisheries of the Great Lakes. 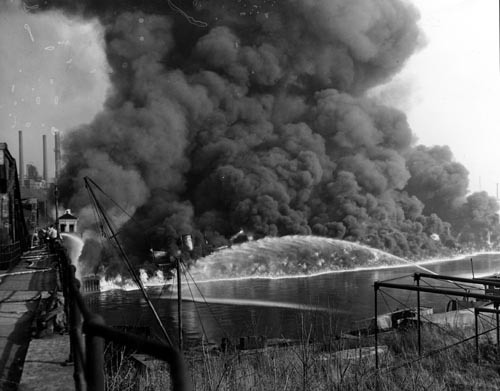 The photo shows the Cuyahoga River fire of 1952, courtesy of the Cleveland State University Library. Pollution controls should be implemented using best available technology. The CWA was substantially amended in 1987 to tackle areas the initial legislation failed to address, including toxics, non-point source pollution, stormwater, and the use and disposal of solids from wastewater systems. The 1987 amendments also created the State Revolving Loan Fund program to help smaller communities tackle water contamination. We should celebrate the good news. The CWA has led to significant declines in point source pollution and contaminated water discharged at a specific location such as a pipe or outfall. Water quality in rivers, lakes, and streams has often improved, sometimes substantially. But the law is out-of-date and desperately in need of new thinking about water and new amendments to strengthen it. It has not been as effective as needed in addressing non-point source pollution, especially diffuse runoff with nutrients and other contaminants from farms and cities. These non-point source pollutants are destroying parts of the Gulf of Mexico and Chesapeake Bay, and are seeping into the ground, contaminating groundwater in many areas of the nation. The challenge of combined sewer overflows and management of stormwater has not been solved. Climate changes, and subsequent impacts on water supply and quality, are new but unresolved threats to industry and local water systems. New technologies and contaminants must be addressed. Today we honor the successes of the Clean Water Act, but we also envision a future where the Clean Water Act's objective to "restore and maintain the chemical, physical, and biological integrity of the Nation's waters" is more rigorously and successfully pursued and reached. Details on protecting and improving the nation's freshwater can be found in the new book, A Twenty-First Century U.S. Water Policy.